It looks like the Samsung Galaxy Watch has been leaked just moments before its official unveiling at Unpacked (which you can watch live right here). The imminent smartwatch has been spotted on the wrist of someone attending the launch in New York. 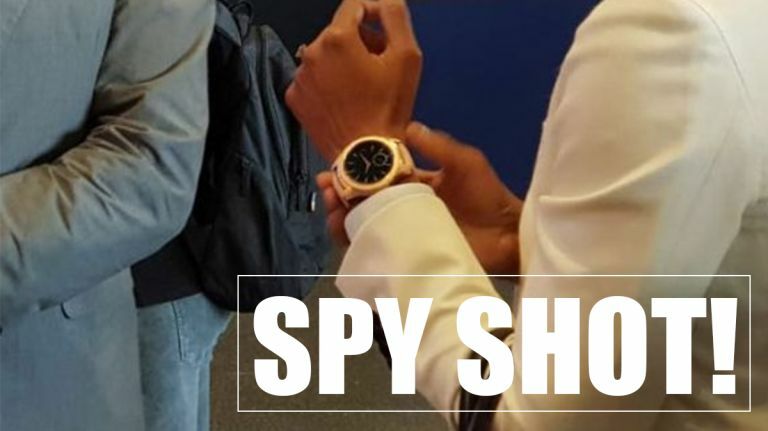 The Galaxy Watch was spotted by T3's sister site, Techradar, and appears to show a yellow gold version of the watch. This joins the Rose Gold version which was leaked when Samsung accidently listed it on its website. The image also shows a sleek and sophisticated black and gold watch face. It's an attractive combination, but it does look rather chunky, especially compared to the petit Apple Watch. Take a look at the image and let us know what you think on Twitter. Is this the Samsung Galaxy Watch? What do you think of the styling? There's not long now until Samsung official show the watch on stage. Samsung Galaxy Watch vs Apple Watch: which is the best smartwatch?